'Marvel Puzzle Quest' R112 Release Notes - D3 Go! 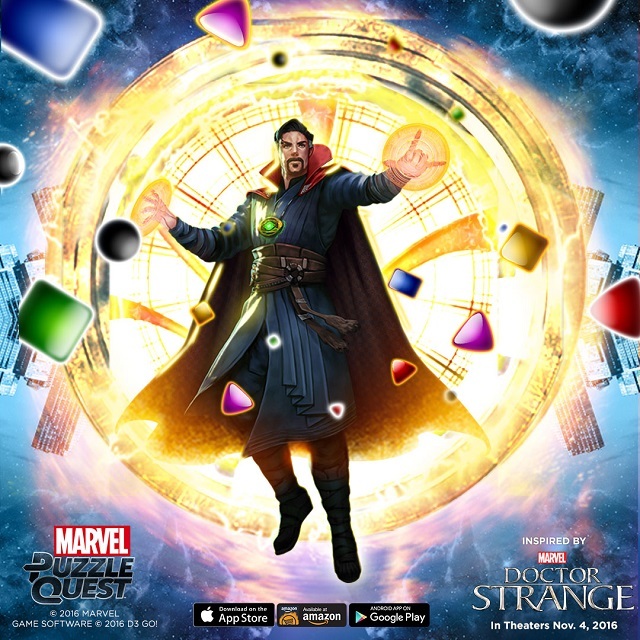 Doctor Strange Event coming November 3rd! – Characters can be filtered by their rarity on the Roster Screen. – The Difficulty Indicator has been removed from missions. – When redeeming a Vault token, the icon on the Vault no longer cycles animations between available pulls. – 1-Stars can be gifted to Facebook friends again. – Changed the sound that plays when gaining XP. – Players who do not have a Versus name will now be able to gain XP for rostering new characters. – A black screen is no longer seen after earning a character from a comic pack. – Players without characters are not given the option to send characters as Team-Ups (This was causing a crash on some devices). – The Promote to Champion button is now visible when viewing a character in the Training Screen (if they can be Championed). – Fixed visual bug: The event progress bar for Deadpool’s Daily will now increase if players only complete the “That Guy from That Place” mission. – Players no longer lose their Legendary Token when MPQ is removed from the device’s memory after purchasing VIP. – Fixed a rare edge case where players were unable to send Team-Ups to players. – Fixed a rare edge case where players saw the incorrect event description. – Fixed a rare edge case where the disconnect from Facebook button was displayed when you weren’t connected to Facebook. – Fixed a rare edge case where Alliance functions were not available when joining an Alliance. – Iron Man (Model 40)’s Recharge power only displays a banner the first time in a turn. – Spider-Woman (Jessica Drew)’s Seeking Redemption power no longer shows the animation after the player’s turn. – Powers that move tiles will now always move the correct amount of tiles. – Powers that target random opponents will no longer target airborne characters. – During a tile match cascade, Elektra’s Shadow Step power will activate immediately when the trap tile is matched by the opponent (instead of at the end). – Powers that target random characters no longer display “IMMUNE” on characters that cannot be stunned in battle. – Cascades no longer prevent some passive powers from activating. – Tiles that cannot be matched are now taken into account when the game detects if there aren’t any valid matches. – Fixed a rare edge case where tile match cascades were not generating AP or dealing damage to the opponent. – Fixed a rare edge case where battles sometimes restarted instead of completing.